The environmental price of China's dominance has been horrific. Half the world's rare earths currently come from a single mine in the Inner Mongolian city of Baotou, where the landscape is strip-scarred and toxic reservoirs are full of radioactive wastewater. Even if Chinese leaders weren't restricting rare-earth exports, the pace of global demand is beyond what China's environment can endure  which helps explain why the government has cracked down recently on illegal mines. And as China's own clean-tech industries grow with the help of generous government subsidies, so has the country's internal demand for rare earths. "The Chinese put [Molycorp] out of business by cutting the price," says Kristoff. "But as they use more rare earths themselves, they are restricting their exports." Flush with funds, Molycorp purchased the Mountain Pass mine from Chevron in late 2008 and reopened it. The new owners intend to spend $500 million cleaning up the mine and refurbishing the processing facility, with the goal of producing 40,000 metric tons of rare-earth ores annually within the next few years. Molycorp executives believe the mine could produce 20% to 25% of the world's rare-earth products by 2014. "We will make a difference," says Mark Smith, Molycorp's CEO. To meet U.S. environmental standards, Molycorp is constructing an on-site natural gas plant to cleanly generate the electricity needed for rare-earth processing. The company will also recycle the mining wastewater, using it to produce the hydrochloric acid and sodium hydroxide needed to separate the rare earths during processing. The new facility will use just 10% of the water that was needed during the Mountain Pass operation's heyday. "We will be the cleanest rare-earth mine in the world," says Cogut. "This is going to be a combination of quantity and quality." The market is already impressed. Molycorp successfully went public in July 2010, its stock price rising from $14 a share to more than $45, putting the company's value at some $4 billion. And Mountain Pass isn't the only rare-earth mine looking to cut in on the Chinese. The Sydney-based company Lynas is opening a new mine on Mount Weld in Western Australia, with plans to produce 22,000 metric tons of rare-earth ore a year by 2012. Element Resources is scoping a potential mine in Bear Lodge, Wyo., which could produce as much as 10,000 metric tons of ore a year. "This is about ensuring the sustainability of sustainability," says Terry Tamminen, the former head of California's environmental protection agency and a Pegasus adviser. For the U.S., breaking China's hold on rare earths isn't just good business. It's also a matter of national security. 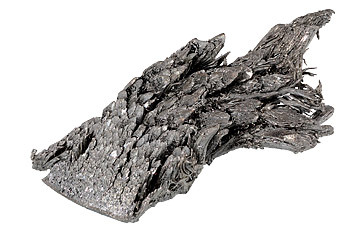 Electronic military equipment depends on rare elements like dysprosium, used in heat-resistant magnets. Some members of Congress want the U.S. to file a complaint with the World Trade Organization about China's rare-earth-export restrictions. But the only sustainable solution will be renewed domestic production of rare earths, perhaps with government help. If a global green economy is going to truly take off, rare earths can't remain rare much longer.